This article is sponsored by Walmart and SheKnows Media. As always, all opinions are my own. An elegant Meat and Cheese board is quick and easy to prepare for entertaining during the holidays and throughout the year. 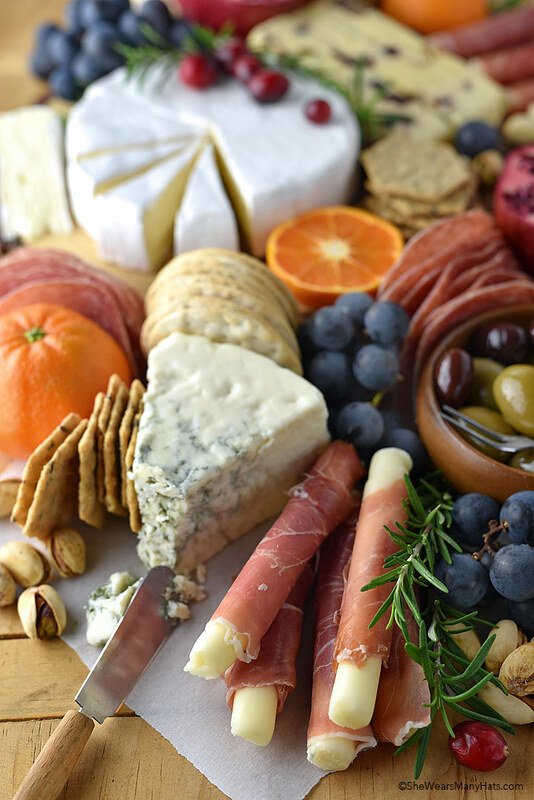 When entertaining, a meat and cheese board is a delectable platter of snacks perfect as an appetizer for a dinner party, or an easy party food to share with guests for holiday occasions. It can be pretty too! A nice big meat and cheese board also offers options for everyone. Sample a little brie? Why not! Maybe a couple olives? Sure thing! A slice of salami with a bite of blue cheese? Sign me up! It seems there is always a finicky eater in the bunch, so a meat and cheese board will surely have something for everyone. But how do you plan and orchestrate this amazing party platter of deliciousness you ask? 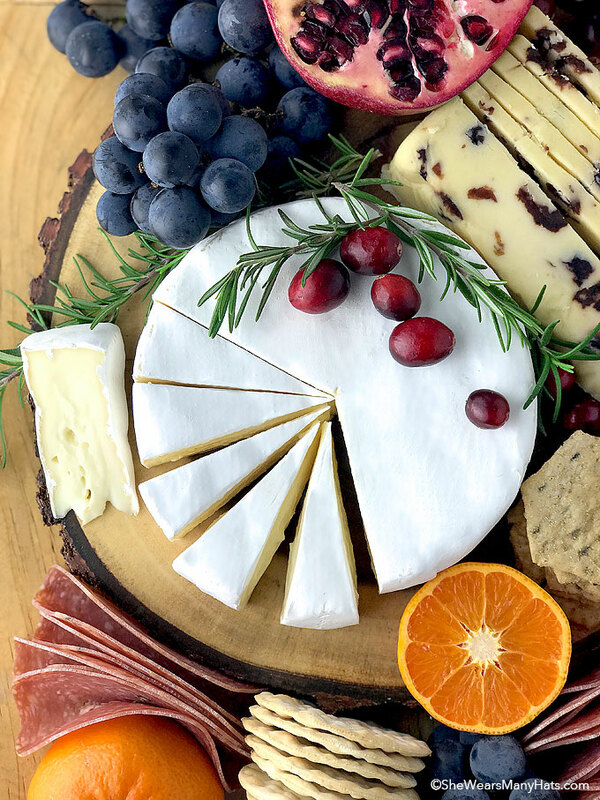 Read below for some simple tips to make your own holiday-ready, party-inspiring meat and cheese board. When preparing this cheese board, I was able to find everything I needed at my local Walmart. They offer a variety of meats, cheeses, crackers, along with fresh fruits and vegetables. And just a few aisles over from the fabulous selection of foods, you will also find beautiful serving pieces and other table top decor to create an amazing meat and cheese board that will make a dazzling addition to your holiday entertaining. Be prepared. 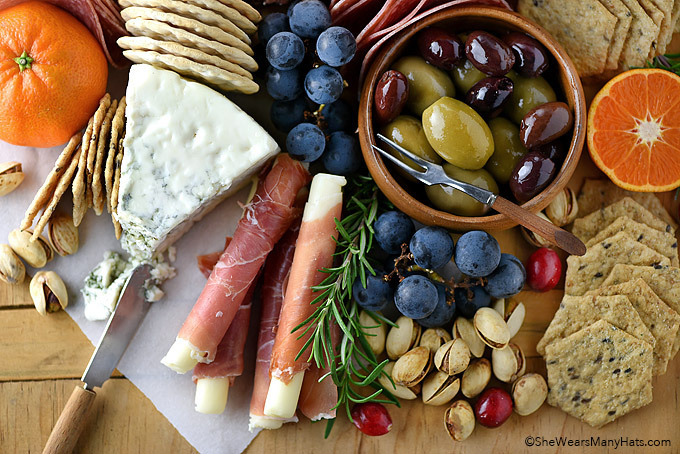 If impromptu parties are more your thing, keep your pantry stocked with easily stored items to jazz up a cheese board. Most cheeses, as well as olives, nuts, crackers, dried fruit and some cured meats have a long shelf life. Stock up before the rush of the holiday season, however, if you do need last minute grocery runs – Walmart’s got you covered. And here’s another great idea during the holiday season. Walmart Grocery allows you to do your food shopping online so it’s ready for a quick same-day pickup. They even load it in your car! How handy is that during the rush of the holidays? I think it’s handy dandy! Variety is the name of the game. Part of the fun of creating a meat and cheese board is offering a nice selection so there is something everyone would like to try. As far as cheeses go, keep it simple. Include both a soft and a hard cheese, and perhaps a blue cheese. I’ve used buttery President Brie Cheese, a festive Somerdale Wensleydale & Cranberries Cheese, and a wedge of Treasure Cave Blue Cheese. Also, there is creamy mozzarella in the Fiorucci Prosciutto & Mozzarella Panino Fingers. They are absolutely fabulous for snacking too! Personally, I keep it light on the meats. A simple thin sliced salami along with the prosciutto wrapped mozzarella goes a long way. I was able to pick up everything for my meat and cheese board at Walmart – they have an incredible variety of products perfect for creating a delectable appetizer board. Color and texture is what makes a cheese board so visually appealing. Meat and cheese can be bland in color so add some color with seasonal fruit and even a bit of greenery. Dried fruit, like apricots, are also a lovely addition and an easy pantry item to keep stocked. As far as fresh fruit goes, offer whatever is in season and moderately easy to eat as finger food, like grapes, sliced pear or apple, or sections of orange. 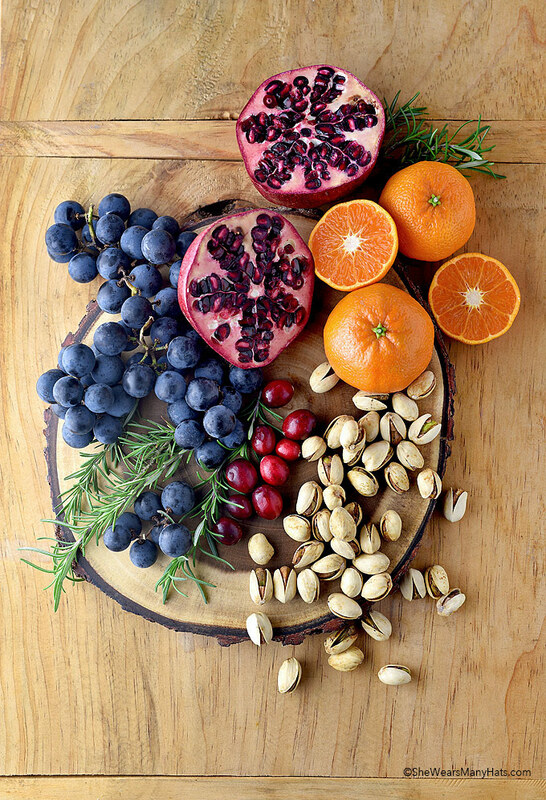 Along with colorful fruit, nuts add a bit of texture as well as being a nice compliment to meat and cheese. Pistachios are easy to keep on hand for impromptu gatherings. Throw in some seasonal flair! Here I’ve used cranberries along with fresh aromatic rosemary sprigs to add a bit of festive holiday flair. The cranberries and rosemary can be repurposed for holiday recipes. Try a Spiced Cranberry Hot Toddy, which would be nice compliment to the meat and cheese board. Keep it affordable. Meat and cheese boards can get real expensive, real fast. Shop for all of your meat and cheese board goods at Walmart to find quality products in amazing variety for less in one stop. In addition to the edibles mentioned above, Walmart offers a nice selection of serving pieces, like the Better Homes and Gardens Acacia Wood Bark Charger shown here. 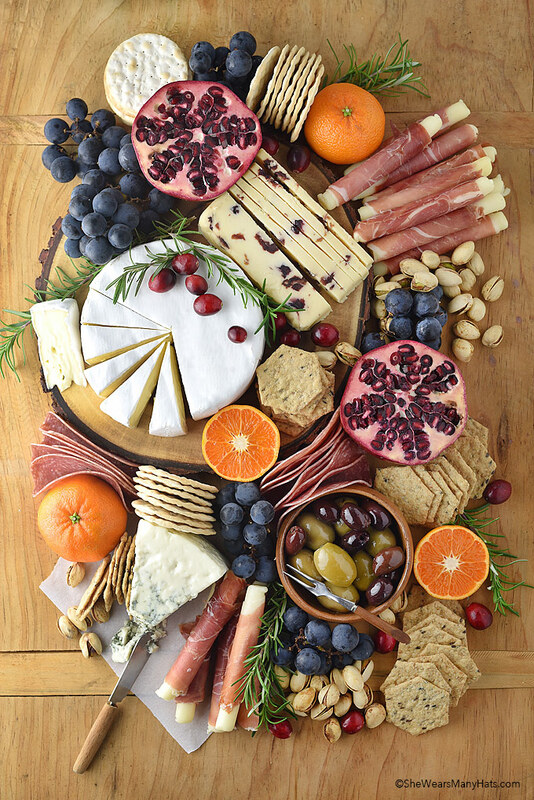 So whether you’re planning a fancy holiday cocktail party, a cozy dinner party or an impromptu gathering with your favorite people, consider a meat and cheese board as part of your menu. Below I’ve compiled a handy shopping list for items shown here that are available at Walmart. Happy entertaining! Amy, this is the most beautiful meat and cheese board I’ve ever seen. Thanks for posting!